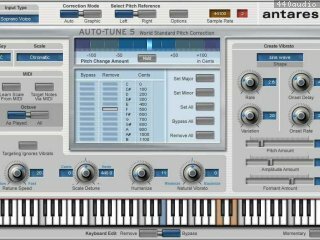 - The Automatic Mode corrects the pitch of a vocal or solo instrument in real time, without distorsion or artifacts, while preserving all the expressive nuance of the original performance. - The Graphical Mode displays the performance's detected pitch enveloppe and allows you to draw in the desired pitch using a variety of graphics tools. 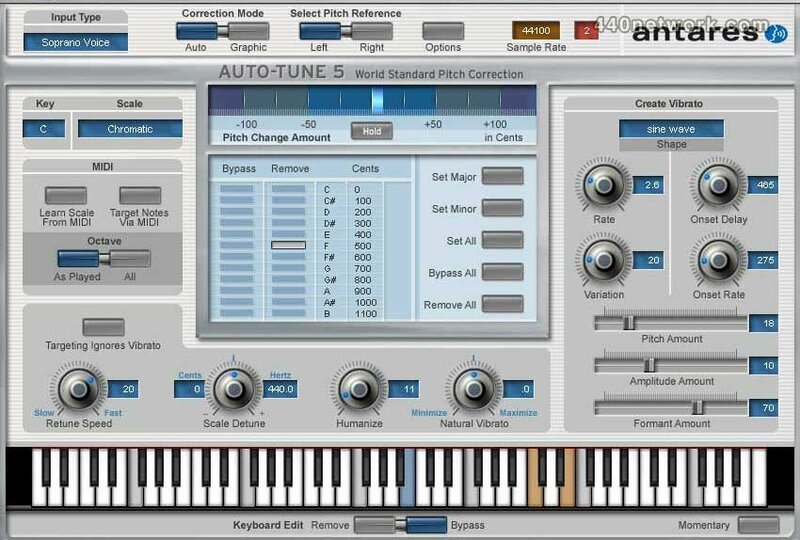 Improved pitch detection algorithm: While Auto Tune's patented pitch detection technology has always provided unmatched speed and accuracy, Auto-Tune 5 introduces improvements in performance with marginal quality (noisy, poorly isolated, etc.) audio. A sleek new interface: As Auto-Tune's features have proliferated from version to version, we have continually focused on maintaining its ease of use. With Auto-Tune 5, we have undertaken a complete graphic redesign. The result is both easy on the eyes and logically groups related controls for intuitive functionality. Consolidated Pitch Tracking control: The previously separate Automatic and Graphical Mode Tracking controls have been consolidated into a single control and relocated to the Options dialog for set-it-andforget-it simplicity. Humanize function: For those concerned about pitch correction that is "too perfect," the Humanize function allows you to set a fast retune speed for short notes, while still allowing natural variation in held notes, for results that are even more natural and realistic. Realtime natural vibrato adjustment: The new realtime Natural Vibrato function allows you to modify (either increasing or decreasing) the depth of any vibrato that is present in the original performance. Larger Pitch Edit Display: As you've no doubt noticed, the Pitch Edit Display is now bigger. Lots bigger. Sync to host transport (host dependent): For hosts that provide valid time information, Auto-Tune 5 will now maintain sync with the host program. Once you have tracked audio and created correction curves, you can move around in your track at will. No more having to always start playback at exactly the same location. Selectable Clock Source: For hosts that do not provide valid time information, Auto-Tune 5's clock display and selection functions let you use an internal time reference for Auto-Tune 4 style operation. Realtime pitch tracking display: During the Track Pitch process, the graphic representation of the pitch and envelope will be displayed in realtime as the audio plays. Multiple simultaneous Graphical Mode instances (host dependent): You can now have multiple instances of Auto-Tune Graphical Mode operating on different tracks simultaneously, even if their windows are not open. In previous versions, since you had to have plug-in windows open to engage Correct Pitch mode, only open instances could be active. No longer. Editing functions no longer modal: You can now use all of the graphical editing features while Auto-Tune 5 is either tracking or correcting pitch. Realtime graphical vibrato depth adjustment: The Adjust Vibrato control allows you to modify the depth of vibrato in your audio while preserving the contour of the original vibrato. Moving this control results in a real-time graphical representation of the resulting vibrato contour. Dedicated Snap To Note button: When using the Line Tool, clicking this button constrains the tool to exact scale notes. Dedicated Clear All Data function: Provides a convenient method to instantly clear all saved tracked audio and correction curve data. Compatibility with Pen Tablet Input: With a pen tablet, you can control Auto-Tune 5's graphical tools (as well as all the other controls) using a familiar pen-style input device. A pen tablet can offer increased drawing accuracy with less wrist stress in long sessions.